Fortune shines! My second Sweet & Simple bake and it’s another chocolate one, so no having to think twice. Not that there was much thinking to be done – I really enjoyed doing the last one as it’s fun to see the same thing baked by many and to discover how varied the results are. I’ve been wanting to make brownies with macadamias for some time now and as I prefer not to have my cakes too sweet, this presented an ideal opportunity to swap the white chocolate in the original recipe for macadamias. I cut the quantity by a third from the original as even for me this was rather a lot of brownies to munch my way though (or so I thought). See Sweet & Simple Bakes for the real thing. Melted 200g 70% dark chocolate with 200g unsalted butter and left to cool slightly. Beat 4 duck eggs, 180g soft brown sugar and 2 tsp vanilla extract. Sieved in 125g spelt flour (100g wholemeal & 25g white) with a pinch of salt and mix until combined. Stirred in 100g macadamia pieces. Poured mixture into a 9″ sq cake thingie and baked at 180C for 20 mins. Allowed to cool a little then sprinkled the top with 1 tsp icing sugar and cut into 16 squares. Despite the warning Maria gave about this, I did slightly overcook the brownies (by about 3 minutes I reckon), so they were not as gooey as I would ideally have liked. However, they were moist and tasty, not too sweet and with a delicious macadamia crunch. They have also been fantastic keepers, tasting better with each day that passes – one week on and I am still eating them (chief taster having succumbed to the flu and unable to be tempted). I now regret the decision to not make the full quantity as these were so good and an ideal opportunity to put some by in the freezer – hey ho! He did get to taste one of the brownies before being rushed off, but I’m not sure his mind was really on it. My concerns for his welfare explains my lack of recent posts. Tomorrow, I’m off on my Schumacher course, which is why I’ve posted this a day or two earlier than the official posting date. These look lovely, and I agree that macadamia nuts (or nuts of some sort – macadamias are soooo expensive!) are probably nicer than white chocolate! I hope your chief taster makes a swift recovery! Blimey, poor chief taster and poor you, I hope life gets back to normal soon. I have been missing your posts! These look very scrummy and I love macadamia nuts and I love the snow flecked top – very seasonal. Hope the Schumacher course is great and look forward to hearing all about it. hope CT is back on his feet soon – a bit of brownie power will help him along no doubt. They look moorish. How come you used duck eggs? I do hope your Chief Taster is well. 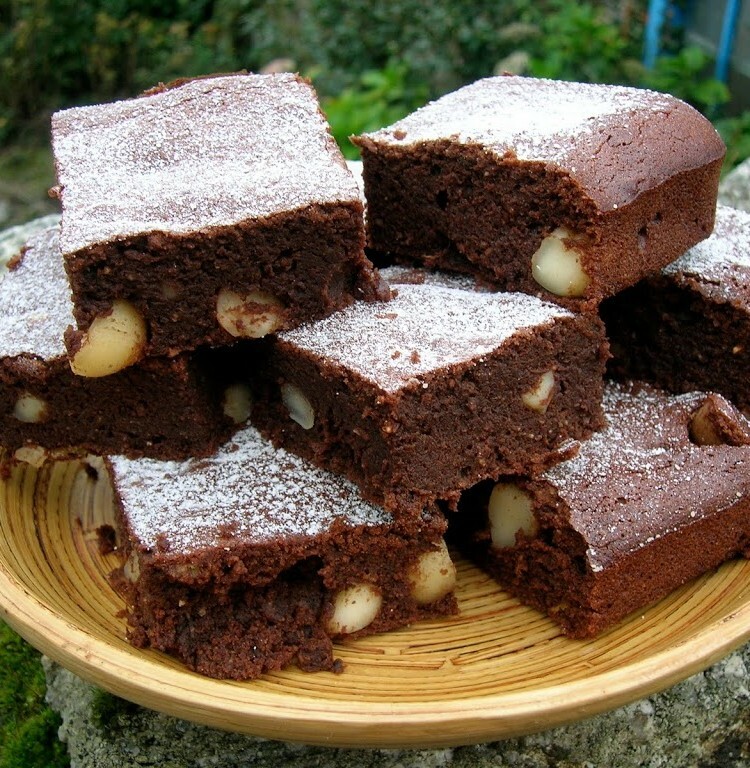 And these brownies look lush, something to perk those of us feeling a bit down ‘cos of the weather. Oh no hope the Chief Taster feels better soon – you’ll have to make more brownies on his return! I know what you mean about them keeping well too, mine are still tasting fabulous over a week later! Awh, I hope your taster gets well soon!! wishing ur chief taster a speedy recovery and u all the best. The addition of Macadamia nuts is paramount. Great idea. I loved these brownies and love macadamia nuts. I will have to try that next time – great idea! Oh girl, you have out done yourself here! They look absolutely incredible!!!! Well done you!!! Thank you all so much for your supportive comments – always brings a glow to the heart. I am now back from Schumacher somewhat revived having had a fantastic time with fantastic people and eaten a lot of great bread. CT was well looked after in my absence. He is now sitting up for longish periods and I am finally able to have a rational conversation with him again – which is a big improvement. It could be a while though before I get around to making another chocolate cake or even bread for that matter. Still Christmas is looming, so I will have to get my skates on at some point. Chele – My next post will be about the course, even though chocolate was not much in evidence. I love the use of macadamia nuts. It is a good brownie and this, I am sure, only made it better. I’m always in two minds as to whether I want nuts in my brownies or not. Macadamia may be the way to go though.